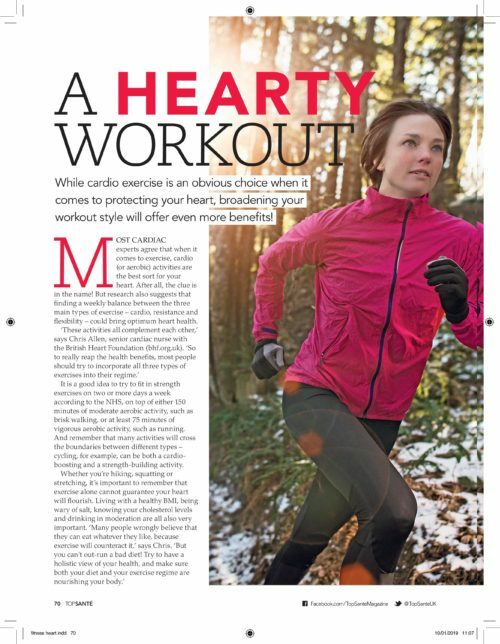 While cardio exercise is an obvious choice when it comes to protecting our heart health, broadening your workout style will offer even more benefits. Most cardiac experts agree that when it comes to exercise, cardio (or aerobic) activities are the best sort for your heart. After all, the clue is in the name! But research also suggests that finding a weekly balance between the three main types of exercise – cardio, resistance and flexibility – could bring optimum heart health. It is a good idea to try to fit in strength exercises on two or more days a week according to the NHS, on top of either 150 minutes of moderate aerobic activity, such as brisk walking, or at least 75 minutes of vigorous aerobic activity, such as running. And remember that many activities will cross the boundaries between different types. Cycling, for example, can be both a cardio- boosting and a strength-building activity. Whether you’re hiking, squatting or stretching, it’s important to remember that exercise alone cannot guarantee your heart will flourish. Living with a healthy BMI, being wary of salt, knowing your cholesterol levels and drinking in moderation are all also very important. Cardio activities such as running, brisk walking, rowing, swimming or cycling are all fabulous for your heart. Cardiovascular exercise is brilliant, not only for the heart itself, but for the systems in which the organ functions. For example it is known to reduce levels of ‘bad cholesterol’ LDL, so helping you to maintain clean arteries. Resistance or strength workouts commonly involve weight training, but can include any type of exercise where you lift or pull against some form of resistance. So you might, for example, use the resistance of your own bodyweight to do moves such as press-ups, or squats. In fact, static exercises (such as weight lifting) could even improve certain key markers of heart health more than dynamic activities (such as cycling) according to a recent study at the University of Grenada. ‘Having strong muscles through resistance training will boost your metabolism, helping you burn fat more easily and putting less stress on your heart,’ says Stephen. Activities that develop flexibility – think tai chi, yoga and stretching – don’t always have much direct impact on your heart, although fast-paced yoga flow classes can get your blood pumping. Nevertheless, by guarding against injury and by keeping you supple, flexibility work can help you stay exercising regularly for longer. As such, flexibility is something of an unsung hero when it comes to heart health. Plus, by supporting our mental health, it can have further, indirect benefits. Risk factors for cardiovascular disease have been shown to improve more in those doing yoga than in those doing no exercise, according to a study published in the European Journal of Preventative Cardiology.